Home > Online business > What is Jaaxy about? Find keywords for free! Today I’m going to introduce you to an amazing keyword tool I’ve been using for my business. If you’re a blogger or an online entrepreneur, you may know how important is to find the right keywords in order to get free traffic to your website or blog. 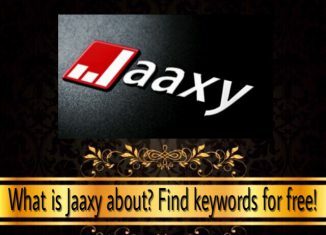 In this review I’ll show you why Jaaxy is the best keyword tool out there and how you can use it to generate more traffic, which will boost your sales! 4 What’s so good and not that good about Jaaxy? 5 How much does Jaaxy cost? 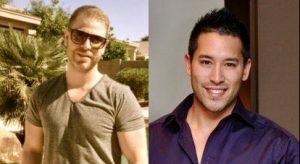 Jaaxy was created in 2010 by Kyle and Carson, owners of Wealthy Affiliate, the best online business training platform. They used their several years of online experience to create this powerful and easy-to-use keyword research tool. 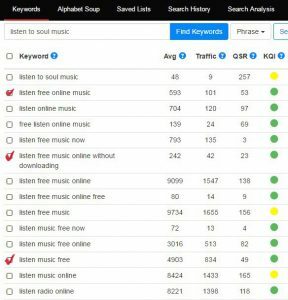 This keyword tool helps you find great keywords in a short period of time like can be seconds, and also has the essential parameters so you can determine the keywords with the most potential. As I told you in my Wealthy Affiliate review, Kyle and Carson are constantly improving and updating WA, and the same happens with Jaaxy. They make sure this tool continues to be the best keyword tool to use in the digital marketing industry. In this section I’ll explain what you can find once you’ve joined Jaaxy and how it can benefit you. Keywords. I searched “listen to soul music” and put a tick on “listen free online music”, “listen free music online without downloading” and “listen free music”, which is the best one because it has an avg of 4903 searches per month, 834 traffic (amount of visits to your website if you’re in the first page of the search engines), 49 QSR (competing websites) and a green KQI (the Keyword Quality Indicator is great). The more searches and the less competition a keyword has, the better. Inside this tool you can also check the domain name availability for the keywords you’ve searched. Saved lists. Once you’ve found good keywords, you can click them in order to save them to a list, which you can check whenever you want. Affiliate programs. This one will allow you to find affiliate programs for your niches, including commission rate and what affiliate network they’re associated with. You can type any keyword related to your website and your website url (for example your website title or a keyword you’ve used in your blog posts) to see where you’re ranked within the SERPs (Search Engine Results Page). You can also do it manually but it can take you a looot of time. 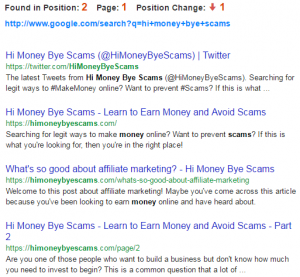 For example: I searched this website title “hi money bye scams” and see below the results I got. As you can observe, if you search “hi money bye scams”, my twitter page is ranked #1 on page 1 on Google, followed by 3 pages of my site. What’s so good and not that good about Jaaxy? Okay, now’s the time to tell you about the pros and cons of this platform. The data is very accurate. You can get tons of ideas with just one search. You can save all the keywords into organized links. You don’t need to install or download any software or program, you can use Jaaxy on any electronic device with an Internet connection. You can search your rankings and get an analysis of your website. It is very easy to use and understand. You can take part of the affiliate program with 0 investment. You can try it out without spending a coin, no credit card required either. Some keywords don’t make sense or are grammatically incorrect. Sometimes it gives you an error when you click QSR to check the number of competing websites. A green KQI (great Keyword Quality Indicator) doesn’t guarantee that you’ll get high rankings in the search engines, but the truth is that no matter your expertise and the keyword tool you use, you won’t rank for every single thing you attempt. The training is only in English, but you can search for keywords in any language. I honestly can’t find more cons, it has more advantages than disadvantages! Want to know about Jaaxy’s pricing? 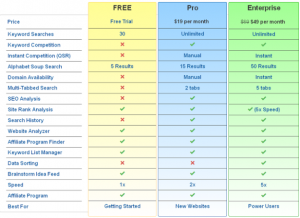 The Free plan offers you some of the features I explained above, even though it has limits on the amount of searches you can do. The good thing is that it’s not a free trial because you can choose to remain free forever. The Pro plan is not that expensive and I think it is the way to go once you’ve built a website and are starting to create content. The Enterprise plan offers all the features I’ve explained and I believe it’s for people who are already making a consistent income. Jaaxy is an awesome platform that not only allows you to find great keywords for your website, it also gives you great ideas and lets you perform other kind of useful tasks that will undoubtedly help you take your business to the next level. Another thing is, this tool gives you accurate information and works pretty fast, which will save you a lot of time that you can spend on other important tasks. 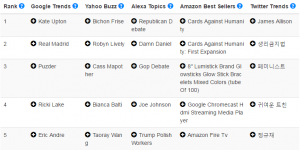 I love using this tool to come up with ideas for my posts, sometimes I search for something in specific and Jaaxy gives me different keywords that I hadn’t thought of before! I definitely recommend it to anyone who’s in the online business world, since it can help everyone in one way or another. It’s completely free to try it out, so what do you have to lose? You can type below any keyword you want to search or click here to join for free! That’s it for today! I hope this review was helpful to you. What do you think of Jaaxy? Have you ever tried it? 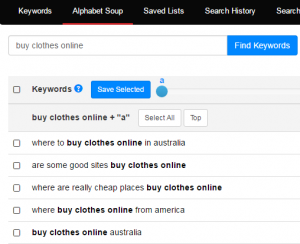 What keyword tool do you use? What about Steal My System? Avoid this crap! Is XsMoney.club a scam? Yes! Honest review here! Fast Income Generator scam – All RED FLAGS exposed! ILoveMoney.online and PartTimeJob.online SCAM – Review exposes these frauds!